1.Check if the Operating System of your PC is Windows XP, Windows Vista or Windows 7, Windows 8. 2.Check if your PC is connected to a network or that a cross cable is plugged in. 1.Open 20-sim and check if the program is properly working, e.g. load a example model and try to simulate it. 2.In 20-sim from the Help menu choose Register / Update License.... This opens the Registration/Update License dialog. 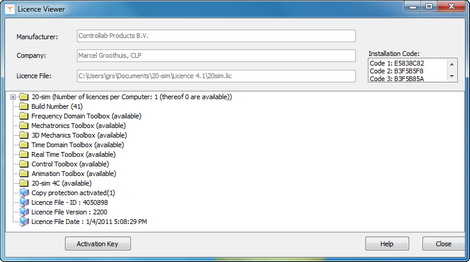 3.In the Registration/Update License dialog select the License Viewer button. This opens the License Viewer. 4.Check if all toolboxes are available (especially the Real Time Toolbox). When not all toolboxes are available, contact you local distributor or contact Controllab Products to obtain a 20-sim Professional license. 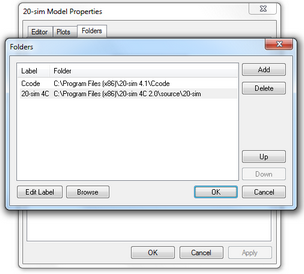 5.In 20-sim from the Tools menu click the Options command. In the window that pops up, click the C-code Folders button on the Folders tab. Check if the right folders are shown. 7.Follow the exercise "Running a Test model". If 20-sim 4C opens after the code generation, 20-sim is correctly installed. 8.Note: depending on the location of 20-sim 4C, the path may be different. Enter you own path here if you installed 20-sim 4C on a non-standard location. when you are generating C-code from 20-sim, the code will be automatically transferred to 20-sim 4C. 9.Follow the exercise "Running a Test model". If 20-sim 4C opens after the code generation, 20-sim is correctly installed.